This morning’s Nintendo Direct brought the news that the sixth generation of the Pokémon series, X & Y, will be launching October 12 worldwide. The games will include an eighteenth type – the Fairy type, which is super-effective against Dragons. In addition to new Fairy type monsters such as the new Eevee evolution Sylveon, several older Pokémon will be retconned into the type, including Gardevoir, Marill, and Jigglypuff. 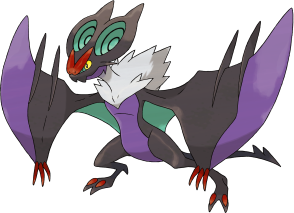 In addition, two new monsters were unveiled in the gameplay videos – a butterfly-like Pokémon named Vivillon and a dragon named Noivern. A new feature called Poké-Amie will allow you to take care of your Pokémon in a Nintendogs-like manner, stroking and tickling your monsters to bond with them. I’m really lookng forward to this game but I don’t like the new Pokemon at all. They’re ugly. Except for Yveltal, that one is cool. You have the most unusual definition of cute. I would imagine all the Pokemon in the Fairy egg group would become Fairy type Pokemon. Makes sense I think. I hope not. I’m not a huge fan of the idea of the fairy type (not of the new type, just the “fairy” part… doesn’t match most of the other types). It would make Cherrim a fairy. Plus I just don’t think they’d change Pikachu’s type. If they did, they would be hyping it right now. Maybe not Pikachu but I think they could make Raichu an Electric/Fairy type. Because it has funky ears? I knew Fairy-type would become a reality, ever since I noticed the leaked source have several things confirmed in which were true, such as the names of the new Pokémon. And as well as the Mewtwo forme. But over all… I think Fairy-type is a brilliant new type to have, as far as the leaked source said about Fairy-type… it’s also strong against Dark-type and Fighting-type, which means it will break the no-weakness issue with Dark/Ghost types such as Spiritomb. Even though Odor Sleuth and Foresight can be used and then a Fighting-type move, but that would still take two turns to defeat it. Surely Dragon-types already have two weaknesses, which are Dragon and Ice, but adding in another weakness balances things more, since most Dragon-type moves are very powerful and most Dragon-type Pokémon have been really powerful, especially Hydreigon. But the best thing of all is that Fairy-type is immune to Dragon-type moves from what the leaked source said, so it’ll be really interesting. And here’s the thing, “fairy” doesn’t always mean those mystical flying things that you’d see in movies or anything. It can mean beauty, cuteness or even something inter-galactic. Like for instance, Marill is a Water/Fairy because of it’s cuteness. And I do have a feeling that Milotic could end up becoming a Water/Fairy because of it’s high beauty. Also, concerning X & Y, there was new released of Mega Pokemon yesterday. So, with all the other iffy Pokemon already seen, Mega Pokemon are released. There are possibly still more to come but I have mixed opinions about this. It seems as if they have lost ideas for Pokemon and I really hope it doesn’t follow the path of Digimon. I mean, don’t get me wrong, some of these Pokemon do look quite epic. These are gonna be really OP anyway; Lucario w/ Adaptability; that’s 2x more powerful STAB moves. Ampharos is now also Dragon type. And to keep the conversation about Fairy types, Mawile is now Steel and Fairy. The Pokemon will need to be holding a Mega Stone to evolve to their Mega forms, I guess that’s the best way to do it depending on how easy it is to obtain a Dragon stone. These are gonna be pretty much legendary Pokemon, in my opinion. I like the idea of Mega Evolution but I wish it would apply to all Pokemon because it apparently doesn’t. That’s not fair. 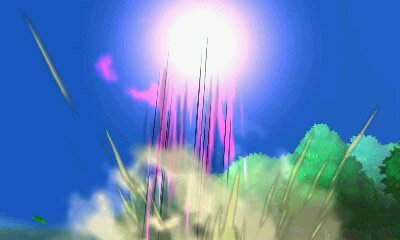 The details of the Fairy type has been released. Fairy is super effective on Fighting, Dark and Dragon and not effective on Fire, Poison or Steel. It is weak to Poison and Steel and resists Fighting, Dark and Bug. It is immune to Dragon. The Steel type apparently loses its resistances to Dark and Ghost though. I feel bad for Metagross. That makes no sense to me. Steel has always been a super-defensive type with little offensive power. It seems so arbitrary to remove those two resistances – it’s not like Steel was horribly unbalanced or anything. I mean, I can kind of understand Dragon, but Steel was fine as it was. And so the first evolutions of the starters have been revealed! Quilladin, Braixen and Frogaider! I kind of think, Chespin’s evolution line seem to be heading in the direction of becoming armoured, I sense the word ‘Paladin’ in Quilladin’s name. Could it’s next evolution be named ‘Knighthorn’? As in Knight and Thorn. And according to the leak in May on PokéBeach, it’s gonna be Grass/Dark! Hm… Frogaider… interesting! This frog Pokémon seems rather taller, but from what PokéBeach said… it’s final evolution will be Water/Fighting! So I can picture how it would look like, just imagine a bulky looking frog Pokémon as the final evolution. As a big fan of Chespin, I was soooo disappointed by its middle stage evolution. However, I’ve grown passed that now and I’m really pulling for a fantastic final evolution. Otherwise, I think I’m learning more towards Froakie or Fennekin as my starter. Except maybe not Fennekin, because there are so many awesome Fire-types this generation I don’t know which one I want to use!